← Ooohh, Black Diamond….err I mean Leather…. Today I cut the black leather cowhide I got at Mcphereson’s and glued it to the coffin. Unfortunately, the glue dries faster than I anticipated and this meant that it isn’t such a clean job. I suppose being my first time and all I’m also struggling with competency issues. However, I’ve got some coffin corners, to cover the nasty seams and some fancy coffin handles on the way. I’m hoping that the hardware will detract from my poor skills with material. Next time I’ll have to outsource that part of the project. 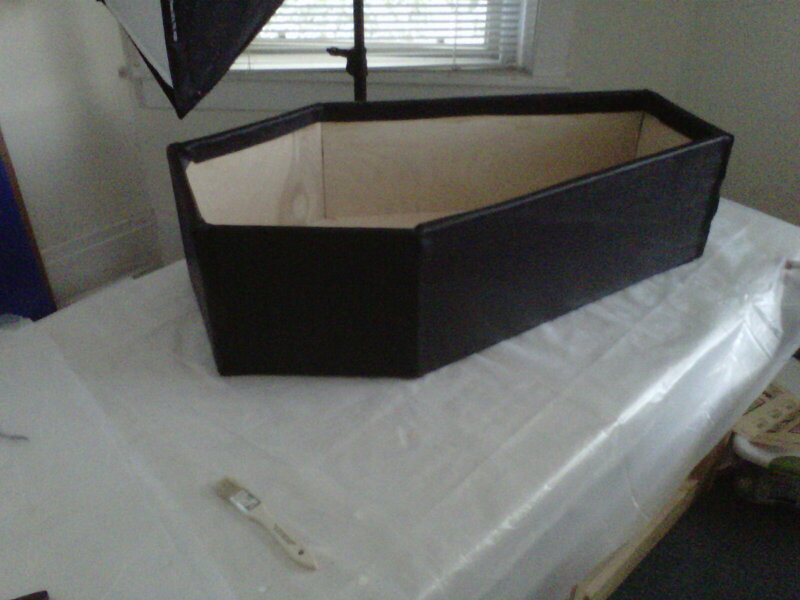 Here’s a pic of the black leather coffin so far. I won’t try doing the interior until all the hardware is installed and I didn’t cover the lid today because I have some hinges to install there as well.